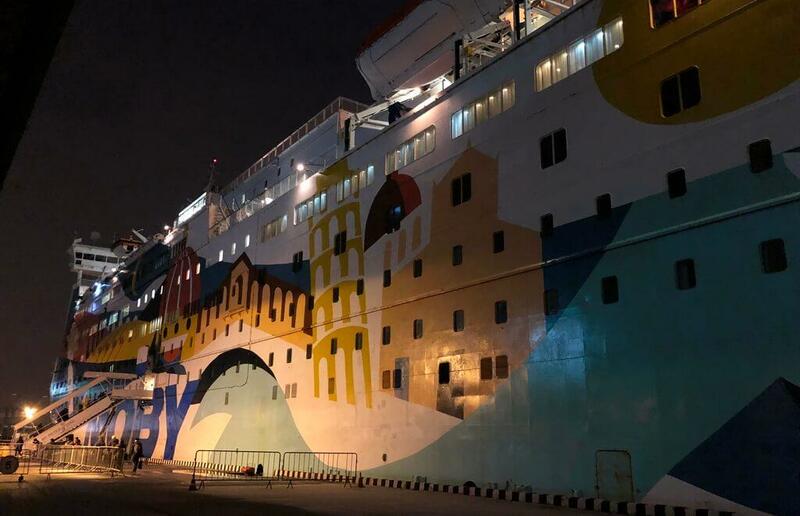 St. Petersburg-based ferry line Moby SPL has announced the start of sales for the season 2019, so you have a good chance to book early and save money as current prices are rather affordable. While the Moby’s schedule remained unchanged (details below), there is some news in pricing. Moby SPL operates one ferry Princess Anastasia cruising around the Baltic Sea: St. Petersburg, Tallinn (Estonia), Helsinki (Finland), and Stockholm (Sweden) on a regular basis with calling to the port of Riga within special cruises. The season 2019 starts on March 23 in St. Petersburg and ends on December 28, which followed by New Year’s special cruises in early January 2020. The terminal where Moby’s Princess Anastasia gets moored in St. Petersburg is The Morskoy Vokzal, NOT the Marine Façade. The Morskoy Vokzal (as the Marine Façade too) is located on the Vasilievsky island in the center of the city with a 15 minute leg by bus to the nearest subway stations Primorskaya or Vasileostrovskaya. The address of the Morskoy Vokzal terminal is 1, Ploshchad Morskoy Slavy (1, The Square of Marine Glory, in Russian – Площадь Морской славы, 1). The schedule of the Princess Anastasia is just like it was in 2018, with a two-week-cycle and two-route format. We mean that the ferry runs along two cruise routes and within two weeks it makes a few trips along them. • St. Petersburg – Helsinki/Tallinn – Stockholm – St. Petersburg (long cruises). You naturally can board the vessel at any port for any leg. • Then the short «version», St. Petersburg – Helsinki – St. Petersburg, from Friday to Sunday with Saturday being for Helsinki. • Then again the short cruise to Helsinki Thursday – Saturday, with Friday being for Helsinki. Important: for the period April 28 – May 12, the schedule looks a bit different as the Princess Anastasia goes to special cruises to Riga and Stockholm during long May holidays in Russia. • or arrive in St. Petersburg on Thursday (the second week of the cycle) and then depart on Saturday. As the ferry arrives in St. Petersburg and departs from here in both cases at 09.00 am, you have 48 hours here from 09.00 to 09.00 – either Friday + Saturday or Thursday + Friday. Which option is better? We think there is no any difference between them. With a Russian entry visa you can stay here as long as your visa permits, of course, no matter how you arrived and how you depart. In case of a visa-free 72-hour stay for ferry passengers, you arrive and leave by ferry (the same rule applies to cruise lines passengers, but the procedure differs). First of all, some news: in 2019, the company has introduced three kinds of fare depending on the terms of refund. • Smart: you are refunded 100 percent when cancelling your booking 42 days prior to your departure date, 50 percent if 41-14 days and zero percent if than 13 days or less. Additional services and surcharges are refunded entirely. • Flex: you are refunded 100 percent when cancelling no later than 14 days prior to departure and zero percent if less than 14 days are left before departure. Additional services and surcharges are refunded entirely. • Low fare: this tariff plan gives the best prices for certain day, but you are refunded zero percent when cancelling your booking. Additional services and surcharges are refunded entirely. We looked into the booking system of Moby and made up a list of some tariffs for four types of cabins, from the cheapest to the most expensive, (there are totally 14 types of cabins) for randomly chosen high season days in July for the both cruises. • B2V is an internal cabin for 1-2 passengers, bunk beds, 7 sq. m., 4-6 decks. • A2 has a porthole (that’s the cheapest cabin with a window) for 1-2 passengers, 8.5 sq. m., 4-6 decks. • CO2 (commodore) has a porthole, a double bed, for 1-2 passengers. Mini-bar, breakfast Deluxe in each port of call and access to a sauna in the morning hours (only one time during a trip) are included into the fare; decks 5 and 6; registration is in a separate desk. • SUI (suite) is a two-room apartment with a seaside view for 1-3 passengers. 26.4 sq. m. Mini-bar, breakfast Deluxe in each port of call and access to a sauna in the morning hours (only one time during a trip) are included into the fare; deck 6; registration is in a VIP hall desk.